Residents of Isawo community in Ikrodu on Sunday appealed to Lagos State Government to complete the “abandoned” Agric-Isawo-Arepo road project in the area. They made the appeal in separate interviews with Newsmen in Ikorodu, Lagos State. 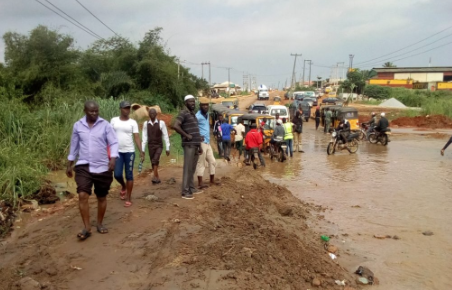 Alhaji Adisa Owolabi, Chairman, Isawo Community Development Association, told Newsmen that the abandoned road project had led to loss of properties, extended travel time and high transport fare for residents. According to the chairman, many communities were often cut off for several days whenever it rains due to the bad road. “From our observation, the Agric-Isawo-Arepo road phase 1 with a completion period of 20 months which began on July 17, 2016 was not up to 10 per cent completion as at September 2018. “The Airport-Oshodi road is more than 50 per cent completed, Agege Pen Cinema flyover bridge is also above 50 per cent completed and the Abule Egba and Aja fly-over were finished in record time of less than 12 months. “All these gave us an impression that our road have probably been abandoned,” the CDA chairman said. Also speaking, the Secretary, Isawo-Agric CDA, Mr Abiodun Sunday, said that the contractor was no more on the site and workers were laid off because of lack of funds. Sunday urged Gov. Akinwunmi Ambode to urgently intervene to ensure the completion of the road which was expected to link the Lagos-Ibadan Expressway. He said that commuters and motorists plying the road were having hard times as asphalt had been removed from the road without provision of alternative road. “Over 75 communities of Isawo, Oke Oko and Igbo Olomu were cut off from other parts of the state. “The flood have also caused loss of property, extended travel time, high transportation fare, paralysed economic activities since communities were often cut off for two to three days anytime it rains,” Sunday said. He commended the state government for embarking on the road rehabilitation and payment of compensation to landlords whose property were demolished for the project. Another resident, Mr Olumide Ajayi, appealed to the state government to resume work on the Agric-Isawo-Arepo road in view of the hardship being experienced by commutters and residents. “We are begging our amiable governor to come to our aid,’’Ajayi said.